Call it Selva di Val Gardena or simply Selva…as the locals do…you’re still talking about the same superb resort. One of three larger resorts toward the head of Val Gardena, Selva is perhaps the best place to base yourself planning on exploring this vast region. Which of course comes highly recommended, both for the near-endless action on and off the slopes. Though beginners and intermediates may be better suited to the pistes at Corvada or Colfosco, Selva still serves up plenty for all ages and activity levels. Particularly those out for something a little more challenging! The pretty roadside village of Selva occupies a prime plot in Italy’s beautiful Val Gardena. Given that it was once part of Austria – and for quite some time too – there’s a certain Tirolean charm about the place that’s impossible to miss. In fact, more people here speak German than Italian! Home to no more than about 2,600 permanent residents, Selva is the kind of place you visit a few times and end up on first-name terms with half the village. Suffice to say, the warmth of welcome and hospitality standards in general are off the scale. Quiet, tranquil and surrounded by incredible scenery, Selva is a little like the kinds of mountain towns you might have drawn as a kid. Small it may be, but the scope of skiing and boarding opportunities in and around Val Gardena are no less than extraordinary. 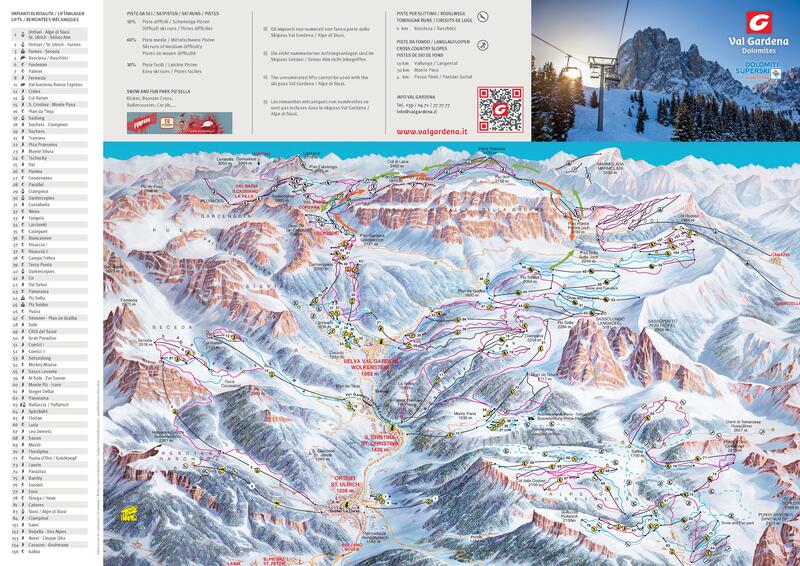 After all, the Dolomiti SuperSki region really is right there on your doorstep! While train services to Selva di Val Gardena are available, you may find it easier to organise a direct resort transfer from your chosen arrival airport. From Germany, Austria, the Netherlands and Belgium, there are good IC and EC connections, coming from Munich, Innsbruck, Brennero to Bressanone or Bolzano. Then it’s simply a case of taking a connecting bus service to your final destination. We carefully calculate all resort transfer services individually, to ensure that our customers never overpay. Whenever you choose to travel and whatever your final destination, Alps 2 Alps will get you there for the lowest possible price. However, we advise booking early to access the best possible deal. In addition, keep up to date with Alps 2 Alps for the latest offers, deals and discounts on Selva di Val Gardena resort transfer services. All of the above will only ever result in our base-rate for ski transfers going down – we never over-inflate our prices at any time or for any reason. We also offer substantial discounts for off-peak, off-season and midweek transfers to Selva di Val Gardena. If looking for the best possible deals, travelling outside peak season or midweek typically results in the biggest savings. We offer midweek (Monday to Friday) prices with up to 60% discount than weekend prices. Your transfer quote will also depend on vehicle availability, transfer schedule, vehicle utilisation and other costs like road tolls and airport parking charges. In all instances, we work hard to keep our prices low and are relentlessly committed to total value for money. Which is why we guarantee you won’t find a better deal on your Selva di Val Gardena resort transfers, whatever your needs. The resort of Selva lies at an elevation of 1,560m, with a max vertical of 894m and its highest lift going as far as 2,454m. There are a total of 70 pistes in the immediate vicinity of the resort, served by masses of ultra-modern lifts and gondolas. Around 30% of the slopes are ideal for beginners, 60% serve the needs of intermediates and the remaining 10% are far more challenging. Of course, it’s important to remember that Selva forms part of the Val Gardena ski region, with 175km of pistes and 82 lifts accessible with a single pass. Or if you prefer, go the whole-hog with a Dolomiti SuperSki pass for your trip, opening up near 1,000km of pistes and more than 700 lifts across a dizzyingly huge region. The fact that the slopes around Selva primarily cater to beginners and intermediates makes it a great choice for families. So too does the presence of a handful of outstanding ski schools – one of which has been getting adults and kids snow-ready since 1937. The fact that the resort itself is so quiet, friendly and enjoyable also makes it the perfect place to head for a trip with kids of all ages. The way we see it, Selva resort transfers are about so much more than getting you to your final destination. After all, you also want to arrive comfortable, refreshed and ideally on time. Not all resort transfer services can promise this – Alps2Alps guarantees a higher-level service for every passenger.